This Barrel Brothers Creamy Vanilla Root Beer Review has a guest reviewer with our regular group today. We’re certainly excited to have Nic Harman, Harman Window Cleaning in to test out a new root beer. Personally, I’m excited to try a root beer that was touted as a creamy vanilla root beer because we haven’t had a really good one on the creamy side of the spectrum in some time. Immediately when I think of an excellent, creamy root beer, I think of the Henry Weinhard’s Root Beer Review, and how good it was. 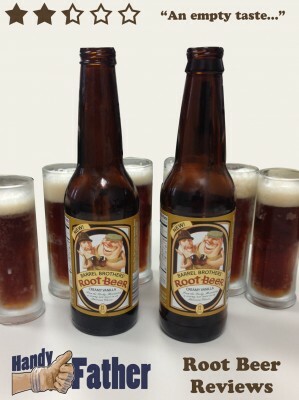 So, naturally we had a couple bottles of Henry Weinhard’s Root Beer the day prior to this review so it would be fresh in our minds what good, creamy root beer is supposed to taste like. Boy were we disappointed in the Barrel Brothers Creamy Vanilla Root Beer. From the Rocky Mountains, this creamy new twist on an American classic has an empty taste. I’m of the opinion that the bare minimum of flavorful ingredients are used to make a “root beer” so the beverage can be pushed to the masses. Even the Barrel Brothers knows that this isn’t their best product, as they advertise another brew on the side of the bottle because there is nothing to brag about in this drink. We gave the Barrel Brothers Creamy Vanilla Root Beer Review a score of 2.25 out of 5 stars because we are kind. The biggest reason to buy a Barrel Brothers Creamy Vanilla Root Beer is for a bottle collection. It has a fun label with the caricatured version of what I assume is the “barrel brothers” themselves. We at Handy Father have warned you about the flavor of this root beer, but want you to do your own Barrel Brothers Creamy Vanilla Root Beer Review. You can buy Barrel Brothers Creamy Vanilla Root Beer here. Don’t take our word for it! If you do, leave a comment below, or tweet @HandyFather and let us know what you think.